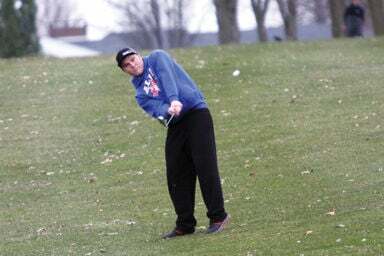 Garin Grinstead takes a swing during a recent golf meet. The Blue Demon golf team placed second at the Albia Invitational on Tuesday at the Albia Country Club. Knoxville won the team competition with a score of 341 followed by Albia (355), Fairfield (366), EBF (371), Moravia (385), Chariton (386), Davis County (405), and Centerville (408). This is our fourth meet and Tein Thiravong shot 83 to make him our fourth different person to have low score on the Albia team. “Tein has shown signs of shooting in the 80’s this year and finally put together a round of golf that I thought he should be shooting this year,” said Coach Hermsen. Ian Flahive had an up and down round and shot 87 which is a decent score for this time of year. “I am hoping he continues to improve and get that 18 hole score down under 85.” Coach Hermsen was pleased with Zach Jones who shot a personal best 40 for nine holes. “Zach has been working on his game and we need him to continue to play solid golf.” Dawson Hermsen continued to be the only golfer to have his score count in every meet this season. He was a little disappointed with his front nine hole score of 49, but he came back with a respectable 44. Others playing included David Fisher (102) and Cody Kosman (112). The Albia boys competed at Honey Creek on Thursday. Full results will be in Tuesday's MN.